It is searing hot here in Metro Manila in the Philippines. Although temperatures in the metropolis have not reached 40 degrees Celsius, most days it feels like it’s way over 45. Summer has always brought scorching days but the sun’s rays seem to be more intense now. “Global warming,” we say to each other, like ants whispering to one another on the way to and from work. Speaking of work, I realized my blog needed some fine-tuning, perhaps something similar to a “spring cleaning,” though I can only surmise what the phrase means because we don’t have spring here in the tropics. The realization came when I finally had some time to read a few blogs, including a post from the WordPress Blogging University. I was able to catch up with Blogging 101: From Zero to Hero, which is already on its 28th lesson (out of 30) . No worries though, all the previous lessons are there, so if you want to take a peek and learn how to improve your blog, you can do so at your own pace. I’m also doing it backwards but it doesn’t really matter. So far, I’ve added a blog roll (Blogs I’m Following) widget to this blog. I’ve seen this in many blogs, but didn’t know its value so I skipped it. It’s on the footer of this blog now, because now I understand why it is important. I also learned how to make picture widgets, and hope to add some to this blog once I figure out what picture widgets would blend well with the blog’s theme. Next week, I will also begin a regular feature. This blog used to have a regular feature, “Sunday’s Blessings,” which I stopped sometime ago. I’m working on starting a regular feature based on the statistics provided by WP. Creating a feature for your blog is lesson #28. Still so many blogging lessons to learn! But I’m sure this blog will look more polished after I’m done with all 30 lessons. Happy blogging, everyone! Thanks for the link and the inspiration. I will look at the tips backwards as well ! Each new learning curve feels amazing for me as a non-techie. I look forward to the Sunday’s Blessings again and I wish you a soothing cool breeze to come your way. 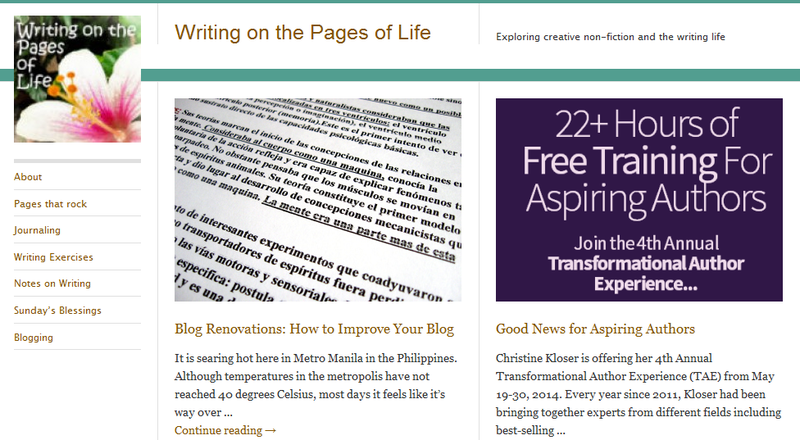 I’ve learned tons from the Zero to Hero and other WordPress daily post stories on blogging. Such a fun hobby! I like your new look. Very tidy and fresh. I’m learning a lot from Zero to Hero too…glad you like the tweaks on the blog! Thanks Marcella. My motto for this blog is, “What I learn, I share!” It feels good to be able to inspire others in anyway. Thanks for the visits and lovely comment. I participated in the Blogging 201. I was able to make changes, okay-I’m still making changes and determine the direction in which I wanted to take my writing. Are you planning on doing the next blogging challenge? I hope you’ll be able to add a regular feature to your blog. I’ve read about the WP daily challenge that’s starting in June….hmmm…. daily blogging again….for now, I’m not sure yet as there are tons of work waiting to be done! The feature, though. That will happen. It’s the daily blogging that probably won’t. Good luck with the blogging course, Patricia!